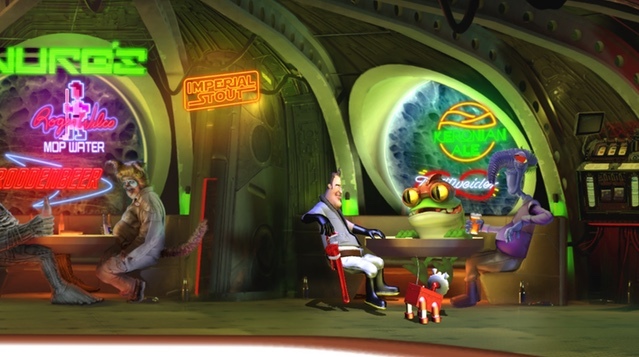 After Mystery House had become a successful first entry to the game business, Roberta and Ken Williams started to think about another game in order to strike the iron while it was still hot. The game, that was released the same year as Mystery House was called Adventure in Serenia, later dubbed as the Wizard and the Princess, which did not only end up selling around 60 000 copies but is also seen as a King's Quest 0, even referenced in the official King's Quest Companion books. 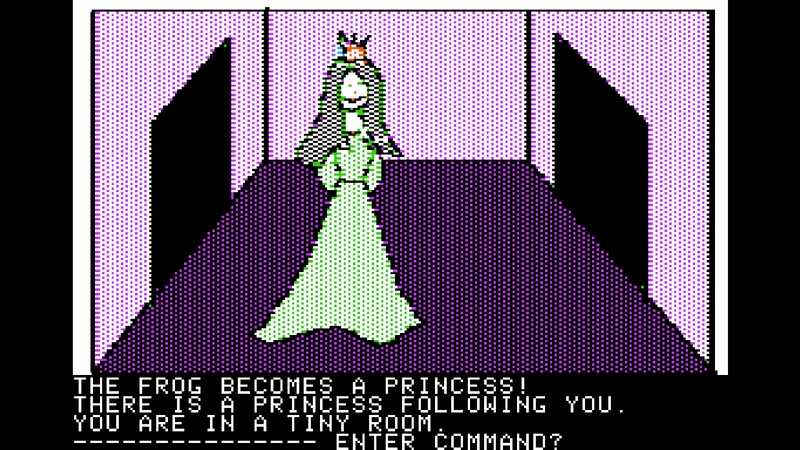 Just like Mystery house, the Wizard and the Princess were also somewhat of an improvement technically, as instead of simple two colour, black and white line graphics, it had actual colours graphics and art, that was done by someone who actually knew how to draw. Music, however, it again had none. 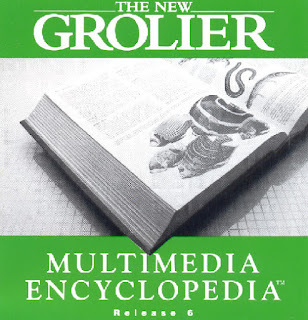 The main bulk of the story is told in the manual of the game. It tells of how an evil wizard Harlin kidnapped princess Priscilla, whom you as a brave adventurer need to rescue. It is not a deep story, but as a whole, I do think it holds up much better than what Mystery House managed to do, as the main goal of the game is to solve how to reach Harlin's castle in order to rescue the maiden. The big dilemma with Mystery House is, that it's only a treasure hunt disguised as a mystery, but in the end, there's no real mystery solving nor detective work done during the game. 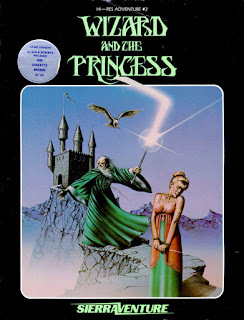 The goal in the Wizard and the Princess is much more focused, so it does in a way feel more plot focused despite many of the puzzles function solely on pure moon-logic not understanding a story, which is told in a terse manner anyway. One of those solid brown coloured rocks is the one you need to solve a puzzle. Might it be this one? So, in the Wizard and the Princess you are a nameless adventurer, who's quest begins in Serenia. After roaming the desert maze for a moment, it comes evident that only way forward is blocked by a snake you need to kill. This very first puzzle lays the ground to what is to come, as it's not as simple as you'd think, despite you are carrying things like a knife and a blanket, which neither can be used to get rid of that pesky serpent. What you need is a rock, which is a statement that sounds easier done that it is. See, every rock you come across in the desert has a scorpion under it, which promptly kills you. This segment, like many others after it, is a game of pure trial and error, as you need to walk around the desert and pick up stones until you find the one that doesn't have a scorpion under it. But as all the rocks look the same, it's just an annoying brute force quest, that measures your determination to continue playing the game and nothing else, if you aren't using a walkthrough that is. And let me be clear about this: if you want to play the Wizard and the Princess, a walkthrough is advisable, as most of the puzzles in the game are just like this one, based on pure trial and error. It present in no way or form even a remotely a game that I'd honestly recommend for anyone, at least not in the modern light. Not that contemporary reviewers were more lenient to the game either, as the few I've seen weren't glowing. Though in all honesty, the ones I've seen have been written a couple of years after the games original release and in the early 1980's a couple of years meant a quite a considerable difference. It was, none the less, a successful title. Some even though it was, at least graphically, a game that would be used as a measurement stick for any new games in the genre. And that, I guess it was. 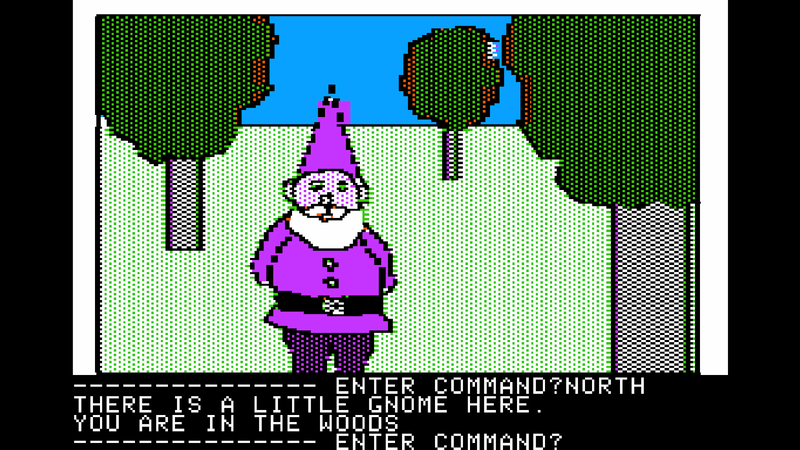 The first appearance of a thieving gnome in the best tradition of King's Quest. But in any case, after you free the desert of the snake, you get to wander the wastes even further, painfully mapping your process and picking up all that isn't nailed down or doesn't kill you. 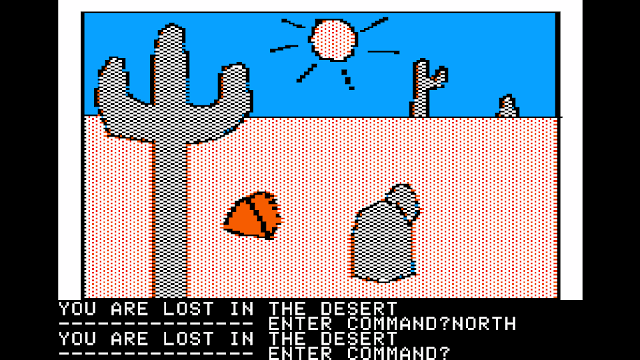 You rescue another snake, stuck under a rock, get some magic words and after a while find a spot where you can get to the other side of the desert by saying another magic word, which is a puzzle where you need to combine lines from two different pieces of paper you've found earlier. That word creates a bridge over a chasm. After some more of the same, you'll figure that a lion needs to be fed with bread, get in a boat which you fix with a blanket, sail over a sea, dig up treasure, turn into a bird, fly over an another patch of water and finally locate a merchant with a tonne of stuff, of which you need to buy only one, but one right one, as no backsies and the wrong item is basically a game over. And I didn't even mention another bridge puzzle yet, which is solved by saying a word, which takes your stuff to the other side the rickey thing, allowing you to cross safely. And none of these magic words I've been talking of gives any real indication of what they're used for. You just need to try them out in the right locations so that you solve the puzzle they're meant for. When you finally arrive at the castle of Harlin, you'll get to experience a yet another maze, before you'll find a bird at a top of one of the towers. The bird is Harlin and you need to turn into a cat in order to get rid of him. Then you are free to kiss a frog that turns into a princess, find magic shoes, say yet another word and apparently Bob's your uncle, as you've won the game with a princess at your tow. Like I said, I don't think the Wizard and the Princess to be a game that has aged particularly well. It has a terrible puzzle design, the parser interface is dumber than a sackful of dumbbells and the gameplay is nothing short of frustrating. 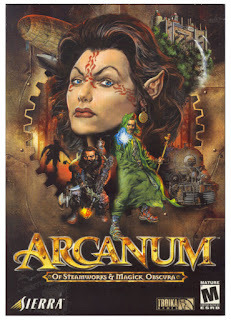 It's not a game I'd suggest for anyone without a walkthrough at least, as fun it is not. Not unless you're willing to open up the games basic code like many did back in the day in order to see what the hell the game developers wanted you to actually do. It is, however, a game with historical significance, as it did bring out advancements to the genre and the technology used in making games. That just doesn't mean it's a particularly good title nor one that has aged well. For a minor graphical improvement, there's PCJR version of the game out there as well, using 16 colour EGA graphics. The pics on this review are from the Apple II version.